If there’s one take away from the trailer for Tom Cruise’s upcoming sci-fi action flick, Oblivion, it’s that Hollywood still has very little faith in science fiction as a marketable commodity. On paper, I feel like I should be optimistic about this movie. An IMDB search reveals Oblivion’s director to be none other than Joseph Kosinski, director of 2010’s TRON: Legacy. Controversial as TRON: Legacy is among fans, nobody can rightfully accuse it of being unpleasing to the eyes. Though a sophomore feature film director, Kosinski’s CV also boasts the sublime “Mad World” Gears of War trailer. Kosinski is further credited as one Oblivion’s four screenwriters, and the co-creator of a comic book of the same name. Although images from the book’s first chapter hit the internet in 2010, they seem to have been subsequently removed at Kosinski’s request. Reported publisher Radical Studios has also disavowed the project from their online store. I expect this has more to do with the legalities of Disney dropping Oblivion and Universal picking it up than any artistic shame on the part of Kosinski. After a quick tally, Oblivion seems to have a lot of potential. Then this happened. Fades, smash cuts, bwanghs, and the sound of drums: behold the usual suspects of movie trailers. In an unexpected twist, this trailer never goes for more than three seconds without a new camera angle. But I’m getting ahead of myself. Let’s start with the first thirty seconds as they, more than anything else, inform the rest of this trailer’s methodology. A middle aged white man stands in a crater revealed to be the site of the last Superbowl. A red headed woman is bored by his sports talk. And what is the man wearing, in addition to the ubiquitous futuresque white space suit? 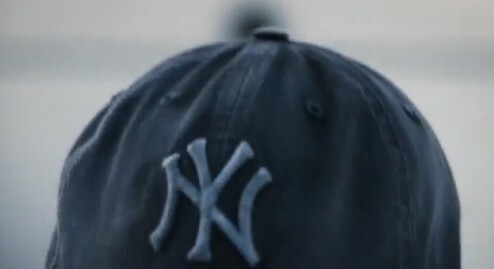 Why, nothing less than a New York Yankees cap. Because all men from the future mourn football while simultaneously identifying themselves with the quintessential American sports team. Oh and there’s also a POV shot of what looks like a robot prostate exam. And don’t forget about the ornithopter in the mid-ground of one of the trailer’s first fifteen discrete shots. Fifteen shots in twenty-five seconds…is that some sort of record for most spastic directing in a trailer? I smell a new Oscar category in the works. What’s the focus of those twenty-five seconds? Not the robot, not the space man with his space gun, but sports and women being bored by sports. Ladies and gentlemen, I give you what Hollywood marketing execs think about your attention span, your interests, and who you are as part of the movie’s target demographic. Go for expository voice over and Tom’s hat. Product placement meets talking down to the audience. Somewhere, an Ad man just bought a Ferarri. Tom’s hat is important because with all the implied aliens, robots, and pew-pew lasers it’s necessary to give the audience something to which they can relate. Nevermind that baseball oozes Americana and words like TRADITION, FREEDOM, and DEMOCRACY. Think of all the money the Yankees must have paid into the production budget for this one scene alone. The trailer then navigates further away from originality and genuine science fiction motifs with the reveal of Zion and the last free humans Morgan Freeman looking legally distinct from any other African American enigmatic leader type who happens to live primarily underground. “I’ve been watching you, Jack. You’re curious. What are you looking for in those books?” says Morgan Freeman. “You’re here because you know something. What you know, you can’t explain, but you feel it. You felt it your entire life,” said Morpheus. Nope, I don’t see how these two characters could be similar at all. Morgan Freeman and Laurence Fishburne star as "The Enigmatic Black Guy" Coming this spring to a theatre near you. Smash cut to a wrecked space ship and the formerly cute Wall-E robots shooting human survivors in stasis pods. But didn’t the exposition tell us all the humans left the earth, save for Tom Cruise and his fellow robot repair crews? Now we have three groups of people in play, with robots killing one group in a world where humans supposedly drove off an alien invasion at the cost of destroying half the planet. Cut to space ships, laser battles, robots, mystery women, and title cards proclaiming “Earth is a memory worth fighting for.” Wasn’t that the tagline for Eternal Sunshine of the Spotless Mind? At this point I’m thinking Oblivion’s formula is 25% Minority Report, 50% The Matrix, 15% Beneath the Planet of the Apes, and 10% Moon – you know just to get the indie weirdoes into the theatre. So much for an original idea from Hollywood. My big question is this: what’s left of the story for me to actually see? It’s pretty obvious that the alien invasion mentioned in the trailer is still ongoing, only in a different way. Though it’s not said, I anticipate some sort of sanctuary world (Eden Prime, Earth 2, Terraformed Mars, Nuevo Terra, Planet Elysium orbiting Alpha Centuri B) where Humanity has been relocated. Except, in a Shyamalanian twist, there is no paradise and all the humans are being stored in those cryo pods for some pointlessly complex reason. Meanwhile, the Wall-E robots are there to perpetrate a terraforming project in conjunction with these cube things, seen below, which Tom Cruise et al believe to be atmosphere restorers or some such hand waving. Of course with the help of his own personal science fiction Baggar Vance, Tom will be able to save the day and bring all of humanity back to the surface of the world…so they can play football and baseball. Alternate option 1: The robots are lying to us for our own good – See I, Robot. Alternate opition 2: Swap aliens for uber plague, possibly from space – See Andromeda Strain and/or Rise of the Planet of the Apes. These things won't prove to be important at all. In the end, the decision to use one-hundred twenty (by my count) different camera shots within the trailer is its own undoing. While the voice over may establish a suitable back story, the endless visuals combine with the dialogue to all but telegraph a likely story. In an attempt to draw in the audience with a “hit ‘em hard, hit ‘em fast” trailer, Universal either gives away too much of the actual story, or presents it as something completely derivative despite an original screenplay. Oblivion once again demonstrates Hollywood’s genre paranoia wherein if a movie doesn’t connect to a proven winner, the studios probably don’t want to touch it.